Hello everyone! I hope you are all having a great weekend, I’ve been bogged under by uni work and have found blogging a great escape from it! I also apologise about the setting of these photos,living in student accommodation it is incredibly difficult to find somewhere nice and light to take some pictures! I think i will be doing my photography outside from now on! 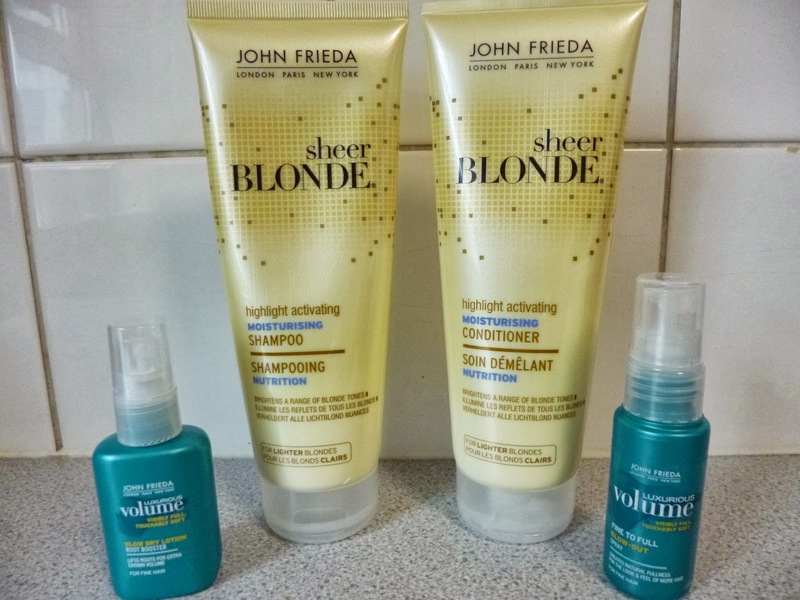 Today i am going to be reviewing some products from John Frieda, from the Sheer Blonde range* and the Luxurious Volume range*. As you all know i have very long hair which is thick but very fine so i find it very hard to give my hair volume as its very flat, i also have naturally very blonde ends to my hair, a mixture of sun damage and the chlorine from a swimming pool haha. So these products are really focused on my problem areas and by helping to enhance my hair and to maintain the colour. 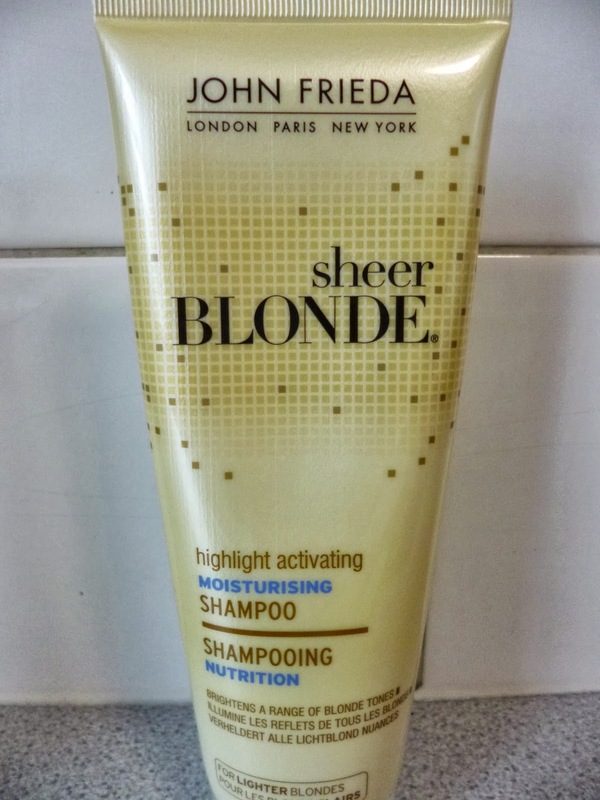 John Friedas sheer blonde range is focused on enabling you to ‘keep blonde’. John Frieda has always been a brand that i have returned to as i love what their products do to my hair and it is a very affordable professional hair care brand. The idea of using the combination of these both is to smooth your hair and to mend porous areas to restore a healthier texture. As well as this it is highlight activating formula and it claims to reveal a spectrum of blonde tones. The scent of hair care is the first thing that will either put me off a product or draw me in to try it. I really don’t like strong smells on my hair but i love the great balance the combination of these two have. There is a slight fragrance to it which is described as being ‘jojoba oil,sunflower and white tea’ it is a rather unusual smell but i love the different notes to the scent and it really is not strong at all and it leaves your tresses smelling beautifully! When i use hair products i always struggle to find something moisturising enough. 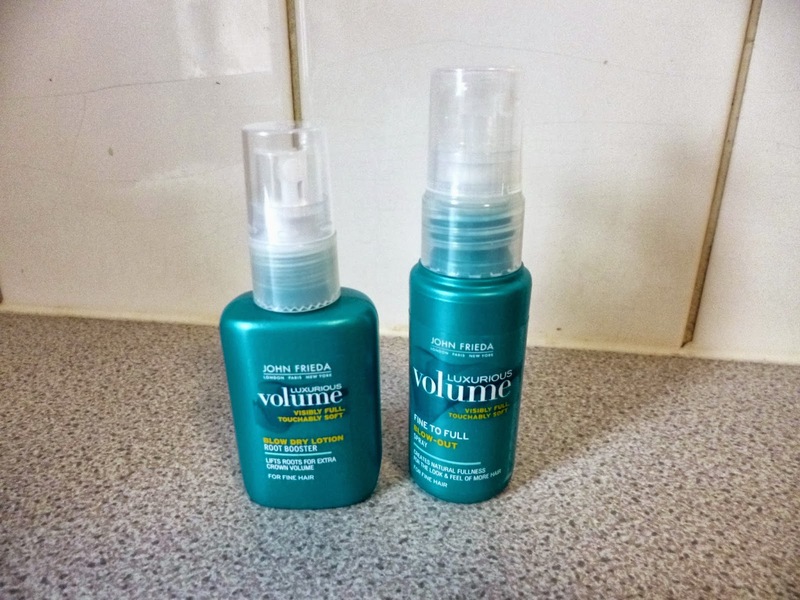 But John Frieda I have been blown away by using the combination of both of these products. It is honestly the first time my hair has felt so sleek and smooth, with barely any tangles for more than just the first day after a wash, the products lather up really well and you barely need to use much of the shampoo. For the conditoner i always use a lot, probably more than i should but it really helps to keep my long hair manageable. The shampoo/conditioner also should help to mend damaged areas of your hair, my hair is in quite good condition at the moment so its hard for me to comment on that but for a product that leaves my hair that soft and manageable it has to be doing something marvelous, with the use of moroccan oil afterwards i’m sure its helping my hair to repair itself even more. As a highlight acitivating moisturising formula i am also very impressed with the outcome after a short period of time. My hair is not completely blonde but as i mentioned before the ends are very blonde, as well as my roots. The use of these has definitely helped to enhance the colour and made it even whiter which i am loving as it means i don’t have to go to the unnecessary damage of dying or highlighting my hair (which i never do anyway!) and it also reveals a full spectrum of blonde tones so even if you have a small amount of blonde running through your hair this will help to enhance that. There are also variations of these products which are aimed at darker and lighter shades,so there is something for every hair colour. As well as this i love that they are bottled in squeezy tubes as its a lot easier to use and it is a more controlled way to get the exact amount of the product that you want to use without any waste. I have only used these two products a few times so i will share my first impressions with you and do a full review at a later time. For a girl with very long fine hair, volume is practically non existent and my hair can look so limp! I rarely blow dry my hair but these products suggest best results if you spritz the hair in the desired places first and then blow dry. I found the fine to full out blow dry a lot better for my hair type than just the root booster because it gave my whole hair a lot more volume and made it appear even thicker, with the root booster i didn’t feel like it gave me much volume at all and the rest of my hair was still so limp. The fine to full out blow dry spray i would liken to the Bumble & Bumble thickening hairspray which i also think is really effective, although i much prefer the scent of this one! 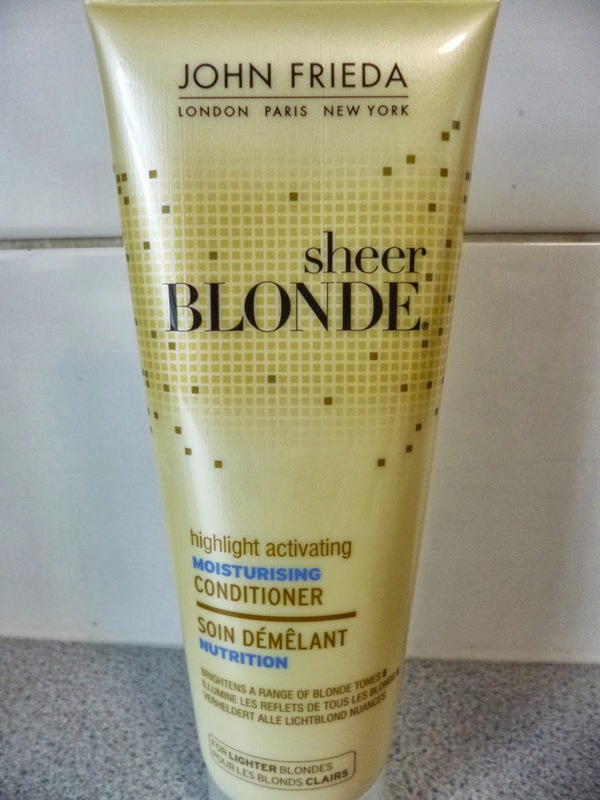 I would fully recommend the combination of the highlight activating shampoo and conditioner in their sheer blonde range as i am so pleased with the results and it is reasonably priced at around £5.60 which you can buy from Boots for usually the cheapest price. Also look out for my full review on the luxurious volume range coming soon! There is also a fantastic Facebook competition running until the 28th October on the John Frieda UK page for a chance to win loads of products and spa treatments. There are lots of different prizes being given away every day so there is lots of chances to win, i have been religiously entering each day! Also, If you’re a fan of youtube you can find John Frieda on their youtube channel, their most recent video gives expert hair styling tips, which was really useful to watch and i’m sure you will all love if you’re a fan of watching hair and beauty tutorials! I hope you enjoyed reading! What do you think of this John Frieda range? Have you tried any of these products?